Microsoft announced Monday that it was buying LinkedIn for a staggering $26.2 billion, and Twitter jumped as high as 4.57% through mid-day trading on nothing more than the hope that the beleaguered media company would be next. Individual investors and analysts alike believe that the deal will lead to more high profile social media acquisitions. Twitter is still a dog and has been for a long time. What’s more, Microsoft has a long history of overpaying for… well… just about everything. Today we’re going to talk about what’s really driving the Microsoft buy and how to handle Twitter if you’re tempted to pile on. Let’s start with Microsoft so we have some context when it comes to Twitter. The thinking is that Microsoft will gain access to LinkedIn’s 433 million professionals and that this will be helpful when it comes to broadening demand for two key products: Word and PowerPoint. LinkedIn, meanwhile, will gain access to 1.2 billion Office users. The vision is to “share a mission” of helping people work together, according to Microsoft CEO Satya Nadella. This deal is about keeping Microsoft Outlook and Office relevant at a time when customers are leaving for Gmail and free replacements. It’s got nothing to do with growth and amounts to little more than a 5-year-old biting a donut in an attempt to prevent others from taking it off the table. Microsoft has a long history of overpaying for purchases, and I believe that’s what they’ve done again here. Somebody’s math was way off and investors who think this spells higher valuations ahead are sadly mistaken and, worse, playing with fire. Remember something we’ve talked about a lot… when it comes to IPOs, mergers and acquisitions, it’s Wall Street lawyers and investment bankers who roll in the dough. Shareholders are an afterthought and last in the food chain when it comes to profits. Few investors remember, but Microsoft wrote off the $7.6 billion Nokia purchase made in 2013. It also wrote down the $6.3 billion it paid for aQuantive in July 2012. That’s $13.9 billion in shareholder wealth down the proverbial toilet so far. Factor in Yammer, Navision, and Rare, and you’re north of $15 billion or so depending on how you account for the “wealth” they’ve failed to add to Microsoft’s bottom line. And that’s not even counting Skype, for which Microsoft paid another $8.5 billion in 2011; it hasn’t been written down…yet. In order for the LinkedIn purchase to pay off, Microsoft is going to have to see LinkedIn generate operating cash flow of at least $4.4 billion against the $28.8 billion it’s just added to the balance sheet. That’s 15.2% of assets and – get this – 5x what LinkedIn makes now, according to Fortune. I think the number’s more like $30 billion myself, but let’s not get too far off track. What you need to understand is that the LinkedIn acquisition is nothing more than a “me-too” move intended to keep it out of the hands of competitors like Facebook, Apple, Google, and Amazon than a transaction intended to keep the company out front. And that brings me back to Twitter. As such, the deal does NOT herald higher values for other social media companies, let alone a disaster like Twitter. Long time readers will recall that I wrote to you on December 12, 2014 and made the case for the only social media profit play I could justify at the time – a short on Twitter stock. The thinking was based on three observations. First, sagging user growth alone posed a mortal threat to a company whose lofty valuation was based on expectations that it would grow its ranks of users exponentially. 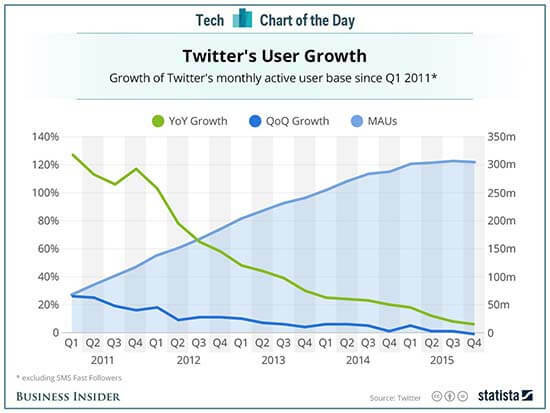 Far from picking up speed, Twitter’s user growth was almost cut in half from mid-2013 to July 2014. Today, user growth is almost non-existent. Case in point, Twitter CEO Jack Dorsey admitted that the number of monthly visitors in the last quarter totaled 320 million – exactly the same as Twitter reported in the prior quarter. 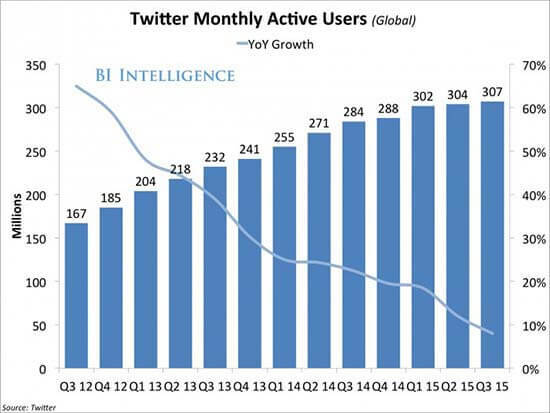 It’s a major sign that Twitter’s already-anemic year-over-year growth may have stalled completely. Ever the optimist, Dorsey remarked that “there’s a lot of opportunity to fix the broken windows and confusing aspects of our product.” Try telling that to the more than 1 billion people who have tried and left. When Jack Dorsey took over as CEO in the summer of 2015 (for the second time), Twitter’s record of engaging users was the one statistic he deemed “unacceptable.” So he launched a few new features designed to entice users to spend more time on the site and ultimately, bring in more ad revenue. For example, that fall, Twitter launched “Moments,” a feature that collects the top tweets and circulates them for users’ benefit, along with the “While You Were Away,” briefing, which was meant to make users feel more connected with the medium and prolong their visit. The average Twitter user spends just 2.7 minutes a day on the app, while Facebook users spend an average of 30 or more, according to a team of analysts at Morgan Stanley. Small wonder Facebook gets almost double the ad revenue per person from its user base that numbers over a billion more than Twitter’s. It’s also no wonder that the company’s market capitalization has fallen nearly 80%, from $48.25 billion to just over $10 billion. Twitter’s business model is fatally flawed if it cannot convert eyeballs to money. Twitter has literally nothing to offer – not for users, not for advertisers and certainly not for potential buyers, as this chart from Business Insider makes abundantly clear. Right now, owning Twitter stock is a lot like going to a Vegas casino with roughly the same odds. No doubt you could get lucky if Google, Facebook, or Apple get interested, but I wouldn’t count on it. No executive in his or her right mind is going to pay billions for a company that literally isn’t worth the combined sum of its parts. And that’s where I want to wind up today. What you need to understand when you see headlines around situations like this is that they’re a gamble. As such, if you’ve got the risk tolerance and the risk management discipline, then more power to you. Most investors do not. That’s why you’re far better off tracking the Unstoppable Trends we talk about at the risk of sounding like a broken record. That’s why your money is far more likely to return huge profits when it’s aligned with companies making “must-have” products that Wall Street cannot hijack, Washington cannot derail and the Fed cannot screw up. So do I still think that Twitter is a great short? The only problem is another set of Wall Street lawyers specializing in mergers, acquisitions, and big payoffs for them, may disagree. And that’s a risk I don’t want you to take. Good article and a great read. I fully agree with your analysis. This will spell a bigger doom for dwindling MSFT. On the same note you have not included the acquisition of Minecraft Game and incidentally, in the all their acquisitions, the CEO’s have left MSFT leaving them high and dry with the many write-offs. Good write up, once again. Good morning Jagdish and thanks for the kind words.